Defence Secretary Gavin Williamson said: “This latest missile system demonstrates the next chapter of the Typhoon which will see the jet evolve its ability to target and destroy any airborne threat at great distances. The Meteor missile will provide an unrelenting deterrence to those who wish harm upon the UK and our Armed Forces. Chief of the Air Staff Air Chief Marshal Sir Stephen Hillier said: “RAF Quick Reaction Alert Typhoon fighters are now armed with the most advanced Air to Air missile in the world, the MBDA developed ramjet powered Meteor. Another huge leap forward in capability for the Typhoon Force, which is proud to continue defending the UK and our allies, 24/7. Meteor is a state-of-the-art complex weapon developed by a six nation European partnership led by the UK. It is built and manufactured by MBDA in Stevenage and has created 430 jobs across the country. “This latest missile system demonstrates the next chapter of the Typhoon which will see the jet evolve its ability to target and destroy any airborne threat at great distances. The Meteor missile will provide an unrelenting deterrence to those who wish harm upon the UK and our Armed Forces. “The RAF’s prized Typhoon Force is unquestionably now the cornerstone of British and NATO military power. It has proved itself in combat roles over Libya, Iraq and Syria, protecting UK skies and overseas territories, and providing critical support to our NATO Allies in Eastern Europe,” said Gavin Williamson, Defence Secretary. “RAF Quick Reaction Alert Typhoon fighters are now armed with the most advanced Air to Air missile in the world, the MBDA developed ramjet powered Meteor. 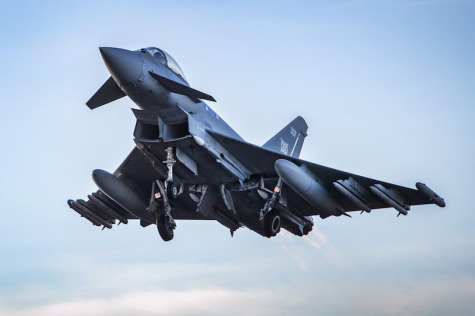 Another huge leap forward in capability for the Typhoon Force, which is proud to continue defending the UK and our allies, 24/7,” said Air Chief Marshal Sir Stephen Hillier, Chief of the Air Staff.